Description: Horton Automatics of Ontario is a business categorized under business consulting, nec, which is part of the larger category engineering, accounting, research, management & related svcs. 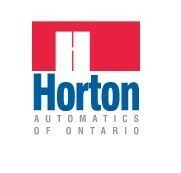 Horton Automatics of Ontario is located at the address 1150 Blair Rd, Unit 1N in Burlington, Ontario L7M 3T4. The Owner is Peter Lawson who can be contacted at (905)331-7491.
Review: Horton Automatics of Ontario is an automatic door install and service company. We specialize in the installation and servicing of automatic and manual entrance solutions for commercial and residential building, such as swing door operators for accessibility, sliding doors, revolving doors, drive thru windows, etc. Location & access map for "Horton Automatics of Ontario"